Looking for the best Caribbean beaches to relax on? Want to explore the best Caribbean islands? Or are you in need of a luxury all inclusive Caribbean yacht charter vacation? Now you can discover the best of the Caribbean with TradeWinds. Sail into a quiet lagoon and relax in the warmth of the gentle Caribbean breeze as your catamaran drops anchor. Do you dive into the warm, crystal clear waters below and swim in the shallows, or relax on deck with a cocktail in hand? The good news is, it’s totally up to you. The calm, alluring waters of the Caribbean Sea make for perfect sailing and great diving as you explore an underwater world. As your Captain sails into a secluded bay, you hear the familiar sounds of calypso music, the heartbeat of the Caribbean. Stepping onto the sandy beach, you find the perfect spot under a swaying palm. The vibrant colors and sounds from local arts, crafts and live music brings to life the very best of the relaxed Caribbean culture and lifestyle. Honeymooners enjoy an unspoilt shoreline as they walk hand in hand along the beach, each footprint in the pristine white sand, mirroring the last. The beauty of sailing to the best Caribbean islands with TradeWinds is that each morning you wake up to a new view, and every night you star gaze, listening to nothing else but the sound of waves lapping. We're pleased to offer luxury yacht charters that visit some of the best Caribbean islands, including: Antigua, British Virgin Islands, Guadeloupe, St Martin and St Vincent and the Grenadines. 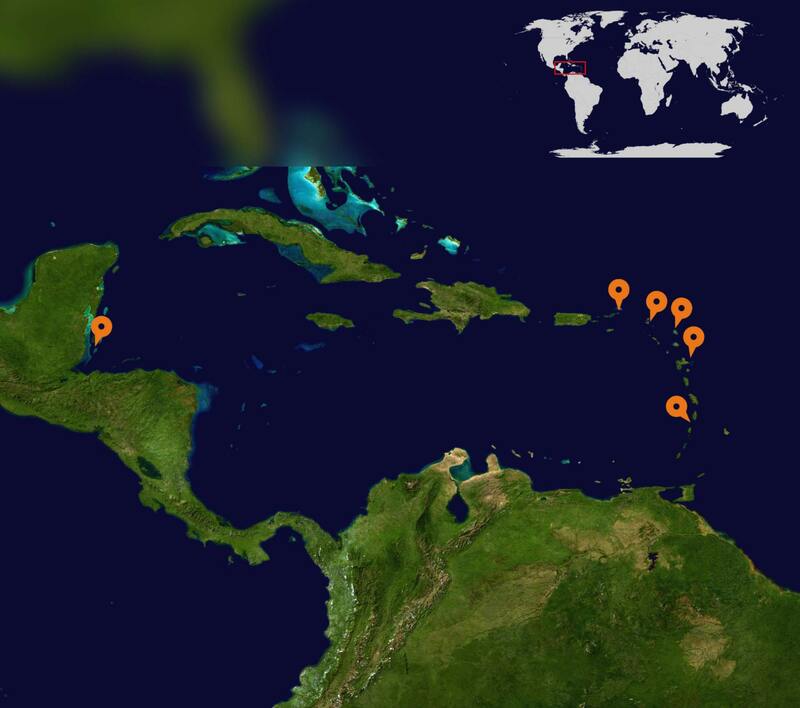 Check out our Map of the Caribbean to see where each island is located. Choosing which Caribbean destination to visit is a tough job, especially when there are so many to choose from. With TradeWinds, when you book onto a Caribbean all inclusive yacht charter, you’ll enjoy a five-star sailing experience as we sail from island to island. We drop anchor in some spectacular places, making sure that you get to enjoy the best Caribbean beaches on our charters. If "liming in the Caribbean" is your style, then you're in the right place! Need some help deciding which Caribbean all inclusive yacht charter to choose? Visit our destination pages for more information on each of our exclusive Caribbean destinations. Only 2% of the Caribbean Islands is actually inhabited. Which means that some of the best Caribbean beaches still remain undiscovered! The Caribbean is comprised of over 7000 islands, islets, reefs and caves. Antigua has 365 beaches - one for every day of the year! Hold on tight as the Caribbean island of Saba is home to the shortest runway in the world - it's only 1300 feet long! The British Virgin Islands are made up of 60 islands and cays, and 16 of these are uninhabited. The French speaking island of Guadeloupe has the highest waterfall in the Caribbean.